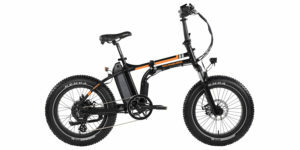 CST e-BIKE PRO, Front: 20" x 1.75", Rear: 16" x 1.75"
Locking Removable Battery Pack, Maximum Rider Weight: 220 lbs (100 kgs), Recommended Rider Height: 4'11" to 6'4"
The Revelo Flex is a unique ultra-portable folding electric bike that seems like a cross between the Yikebike and a more traditional folder from Tern or Dahon. 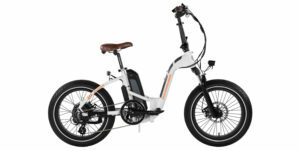 It has pedals, but you don’t have to use them if you’re more interested in scooting around under electric power. The right crank arm has a release mechanism that allows it to rotate back and line up with the left creating an even foot placement. I found the non-pedaling ride position to be more stable. 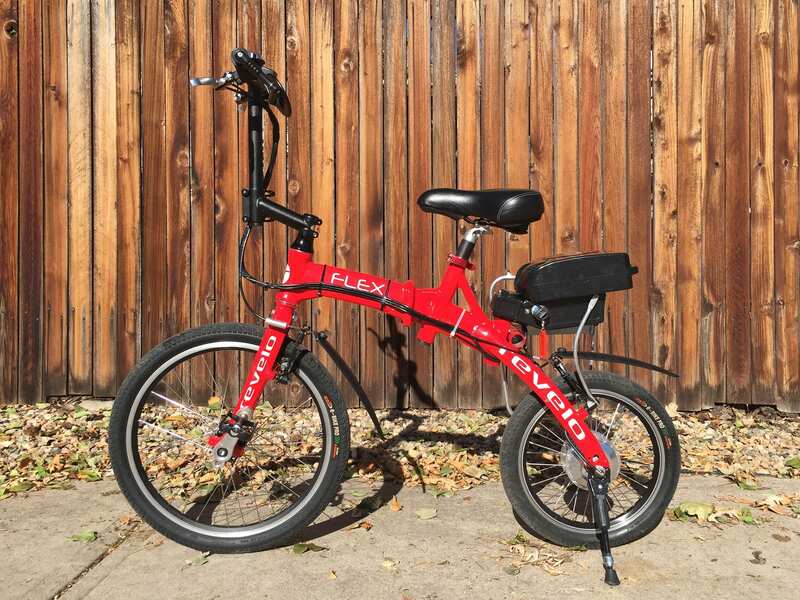 Unlike most bicycles being sold today, the Flex doesn’t use a chain or cassette with gears… it’s a single speed front wheel operated platform much like the original “Penny Farthing” bicycle from the 1880’s. 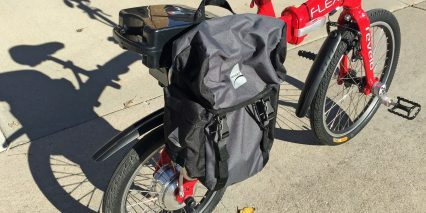 The benefits are reduced weight and complexity with fewer repairs and easier folding but the drawback is stability, comfort and pedaling efficiency. Honestly, pedaling this thing was not much fun because the wheel and handlebar would turn with each foot stroke. Furthermore, the lack of any sort of gearing mechanism means that a natural and comfortable cadence only exists at one speed, about ten mph. 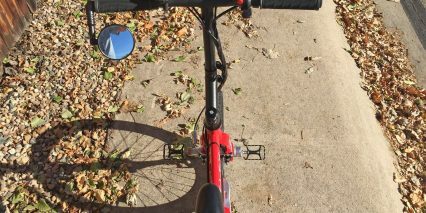 Pedaling seems most relevant for steep climbs when the motor might otherwise struggle on its own. 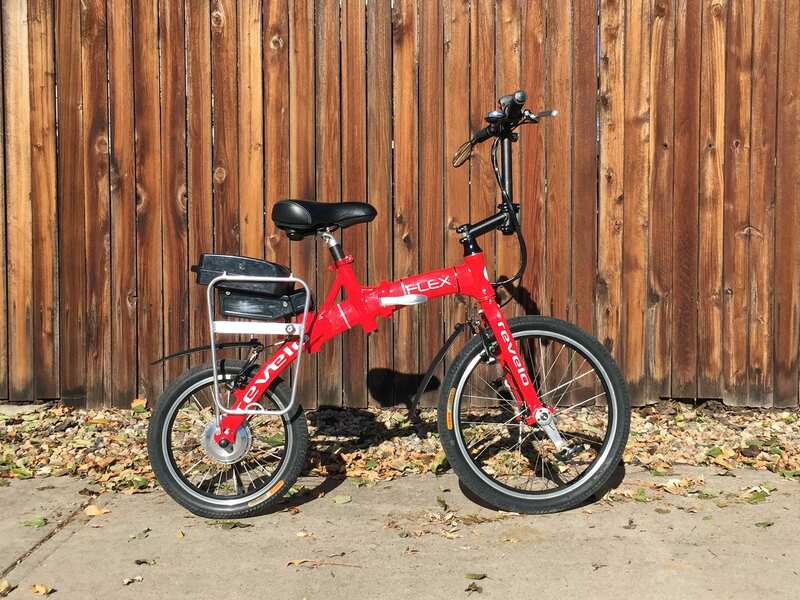 This ebike is wonderful for solving that “last mile” challenge that commuters face, heading to or from the train station or bus stop and it’s so small and light at ~33 lbs that it’s easier to haul on board than more standard sized bikes. It would also be wonderful for boats and RV’s as long as you’re traveling to places with relatively smooth roads. 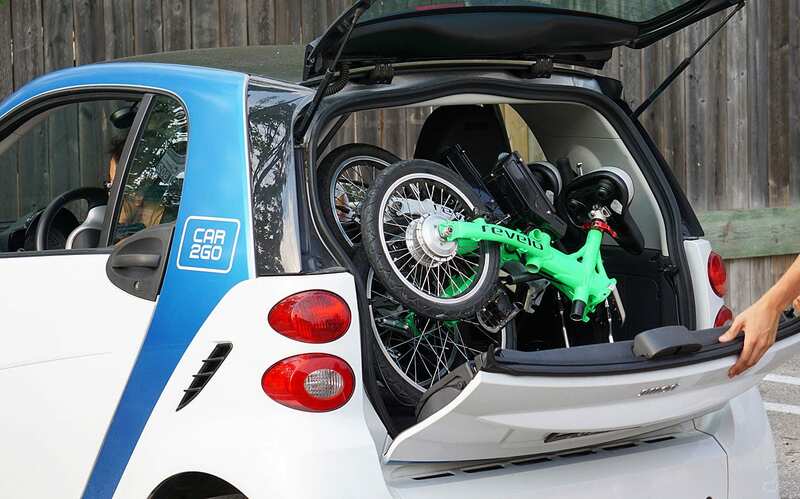 the small wheels and feet-forward position can lead to a sore back and neck going over cracks and bumps but the addition of a suspension seat post (basic telescoping suspension post included with the upgraded version) can really help. From my perspective, the primary value here is small size and light weight. The bike does accommodate tall and short riders pretty well thanks to the quick release seat and stem and I love the optional pannier rack… it works wonderfully with the Axiom Seymour DLX 20 (just one at a time), the warranty is great, there are four color choices and the engineering felt solid. 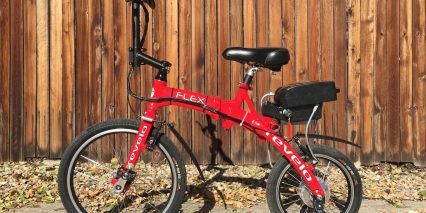 Driving the Revelo Flex is a modest 250 watt internally geared hub motor spoked into the 16″ rear wheel. With a peak output of ~350 watts, this thing really zips! I was able to climb the driveway of my house easily and let a couple of my larger ~200 lb friends test it out. 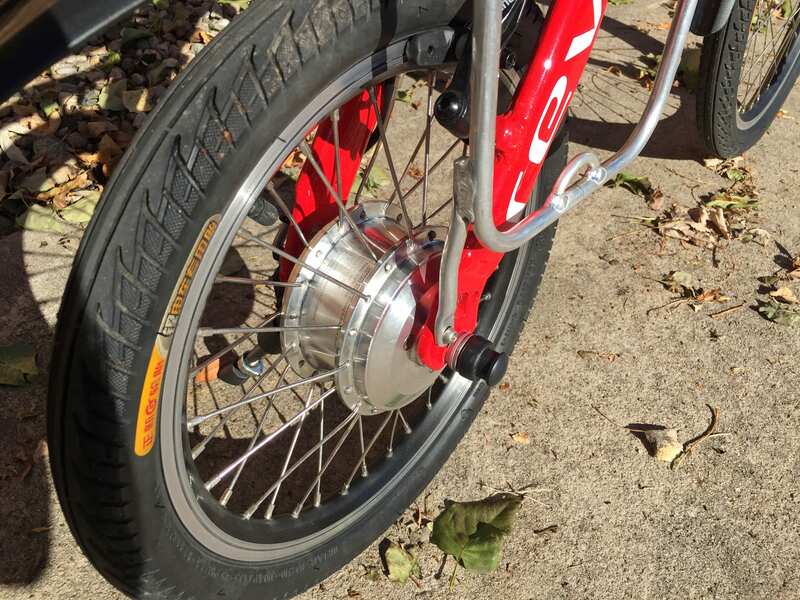 No complaints about power but speed is limited to ~17.4 mph due to the smaller wheel size. 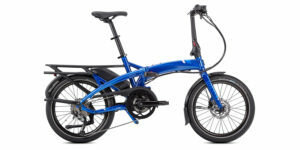 Many folding ebikes run slower than full sized 26 and 700c models and in my view that’s fine because stability can start to drop off with higher speed. 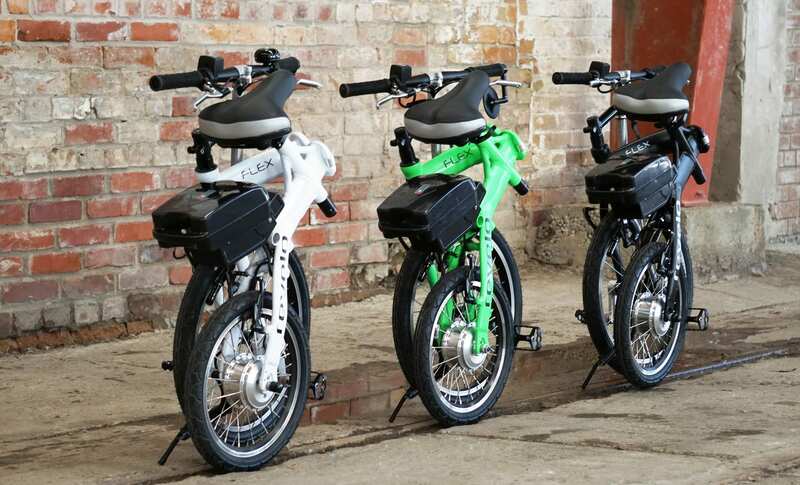 Many similar sized electric bikes I’ve tested only go to 15 mph so I’d consider this an upgrade. Operating the motor is easy using the variable speed trigger throttle mounted near the right grip and there are motor inhibitors built into both brake levers so you shouldn’t have a problem stopping. 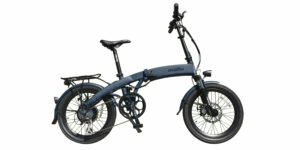 It uses v-brakes which tend to be easy to maintain (tighten, replace pads etc.) 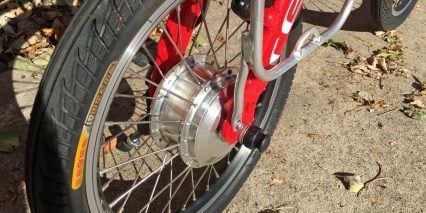 and I noticed a “power modulator” inline for the front brake. This device reduces tension in the brake line if you really bear down. It mitigates the likelihood of a skid… instead of a solid wire going from the lever to the caliper you’ve got a spring inline to take off the edge. 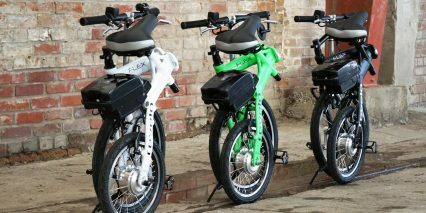 If you go with the upgraded version of the Flex you get SABS anti-lock brakes which might be overkill for the lower speeds and limited commuting applications of this ebike but they do look pretty sweet. 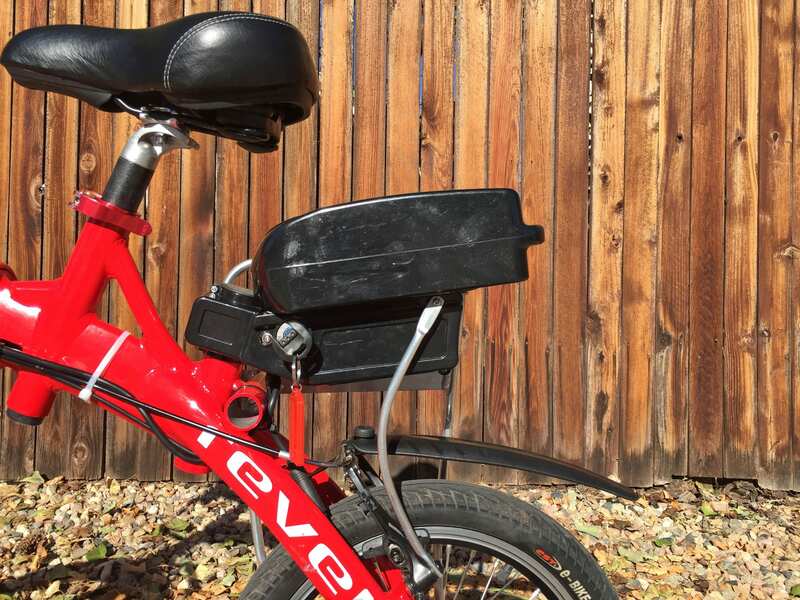 Powering this e-bike is a really nice little battery built into a “Frog” style case. 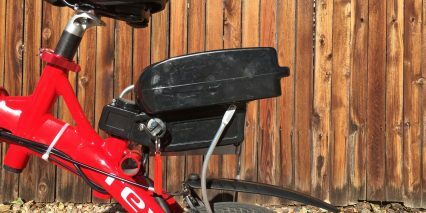 Usually I’m critical of these cases because they seem to crack and break more easily when ridden over rough terrain (specifically, riding off curbs). 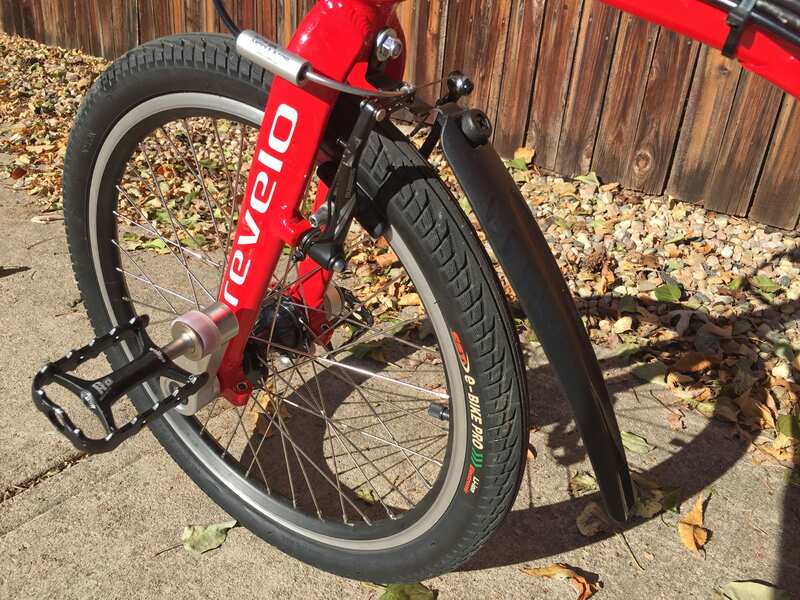 Revelo has strengthened the mount with a left-side strut and mounted it lower on the frame to a purpose-built tube just behind the seat post. 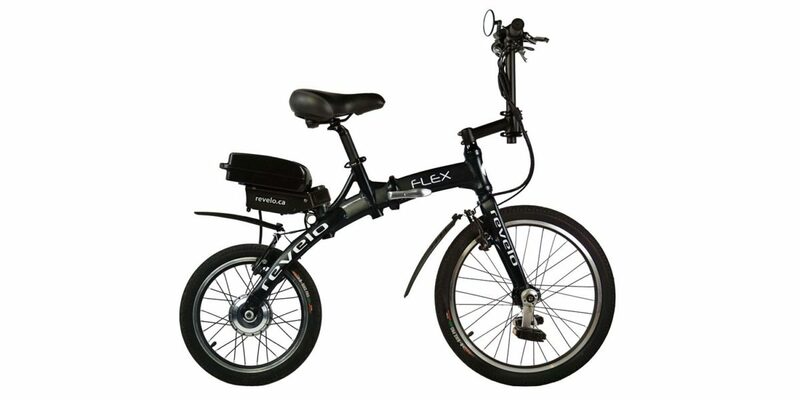 Frog batteries are usually mounted higher up, directly to the seat post, which can also limit seat post position and slow down any type of folding process. So the battery mount feels solid and the pack itself slides on from the back and locks with a metal rod. You do have to leave the key inserted to power this bike and that’s something I regularly complain about but in this case the location is out of the way of feet and legs which is nice. You might hear some jingling or get a snag if you leave the key in while lifting the bike but I love that the head of the key folds in half and is protected in the enclosed section of the frame when the bike is folded… So the battery cells inside the pack use Lithium-ion chemistry known for being light weight and long lasting. 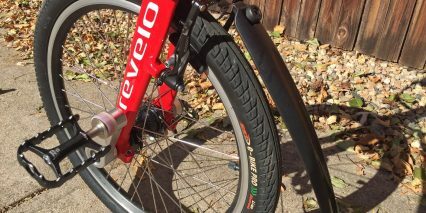 Revelo estimates that you’ll get 1,000+ full charge cycles before seeing capacity drop and they offer an excellent year long warranty. They also sell replacement battery packs and you could always get your own generic Frog elsewhere online (that’s the nice thing about an industry standard part). To really maintain this battery I suggest storing in a cool, dry location (avoid extreme cold and heat) and if you know you’re not going to ride for several months then leave it about half charged so as not to stress the cells. This is how most batteries are shipped because retailers anticipate some shelf time. 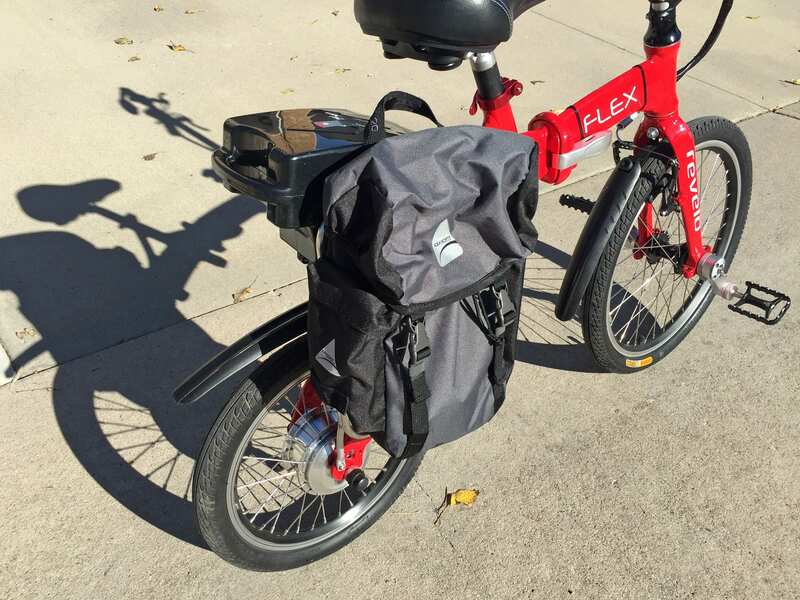 Operating the Flex is about as easy as it gets, once the pack is charged and mounted you simply twist the ignition key to on, make sure the throttle button has been activated and press down on the power lever. The default display unit is super simple, just three LED’s denoting the charge capacity. This is one area where it really feels like there’s room for improvement. It’s nice to get a more precise battery readout, see your speed, distance and even time. If you’re willing to pay a bit more for the Pro or Expert version you’ll get a nice little LCD along with an inline female USB charging port to keep your mobile device full. It makes sense that the display costs extra and I love that they give you this option but the Flex feels pricier than some of its competitors that are slightly larger and heavier. 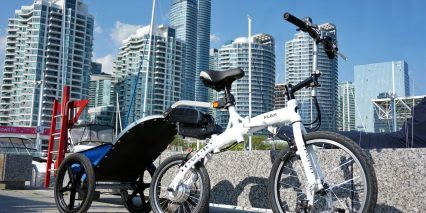 The e-Joe Epik for example retails at ~$1,400 and includes a rack, fenders, lights and only weighs a few extra pounds. It’s larger and more complex to be sure but it also offers a more powerful motor and more gears. The flex is an attention getter, lots of people asked me about it and my Mom thought it was really cute on first sight. I love that it includes quality fenders and the high quality removable Wellgo pedals are something I’ve never seen. 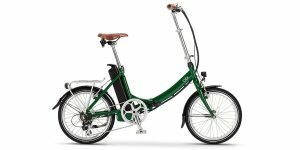 My big takeaway with this bike is stability, it works best as a little scooter when the pedals are both down like pegs. 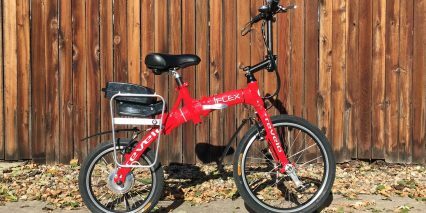 Pedaling felt uncomfortable and less effective than a traditional folding electric bike. 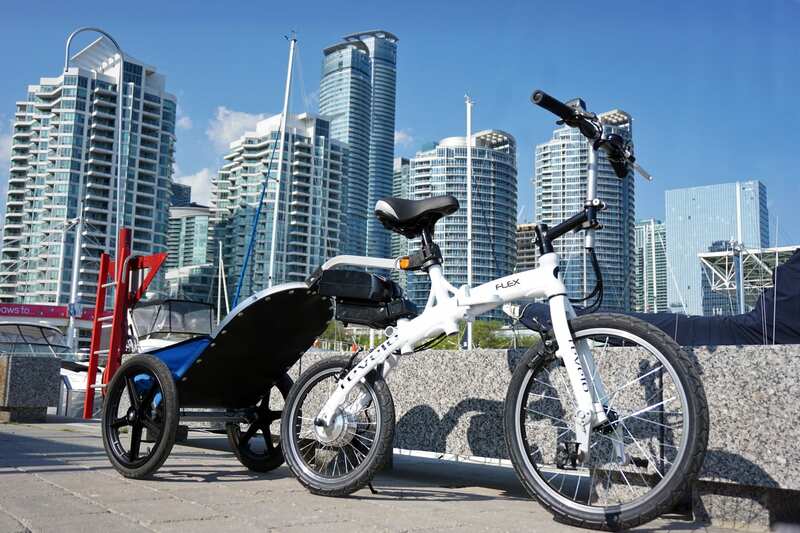 This is all fine, scooting is great and the larger battery provided good power and range with upwards of 15 miles per charge, but the system is definitely limited to achieve that “ultra-portable” size. Yes, it’s easy and fast to fold and the reduced weight does make a difference here… so it’s really all about your intended use. 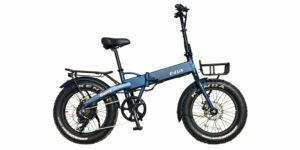 You can get folding ebikes with front suspension and two 20″ wheels like the EZ Pedaler X350 for a similar price but it’s heavier and larger. As mentioned in the first paragraph, you could improve the comfort of the Flex with a Thudbuster and 30.9 mm shim adapter to smooth things out a lot and the company seems to be offering their own solution with the Pro and Expert versions. These fancy posts will add a bit of weight and height when folded but for me it’d be worth it because I go up and down a lot of sidewalks on my daily rides. If you like the look of this bike, need the weight and space savings and don’t mind the limited pedaling options then go for it! You get a nice bell, the option of a single side and a very capable and durable electric drive system. One of the big wins here is the upgraded battery mount an how easy and fast it is to remove the pack compared with the internally mounted designs on some of the competing designs. 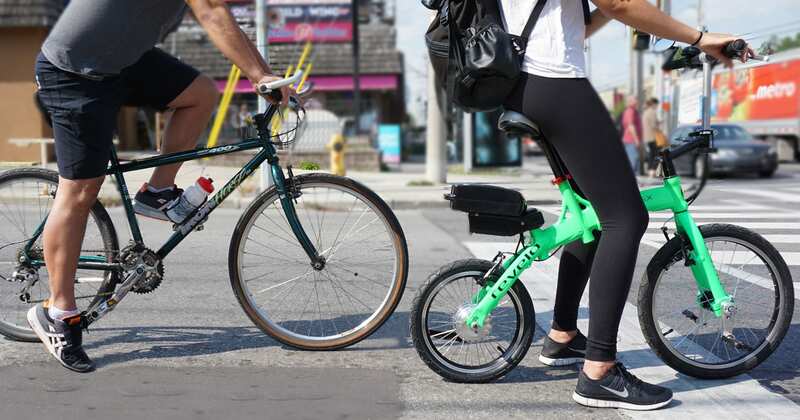 You could pop a couple lights on this thing and easily use it for commuting and probably get away with bringing it into the office more frequently than other options because of how small it appears. 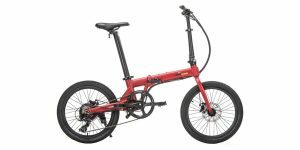 When compared to something like the VeloMini or URB-e (which are similar weight) you get a much better ride but you also pay more. I love the creative new forms being explored for this very old form of transportation. 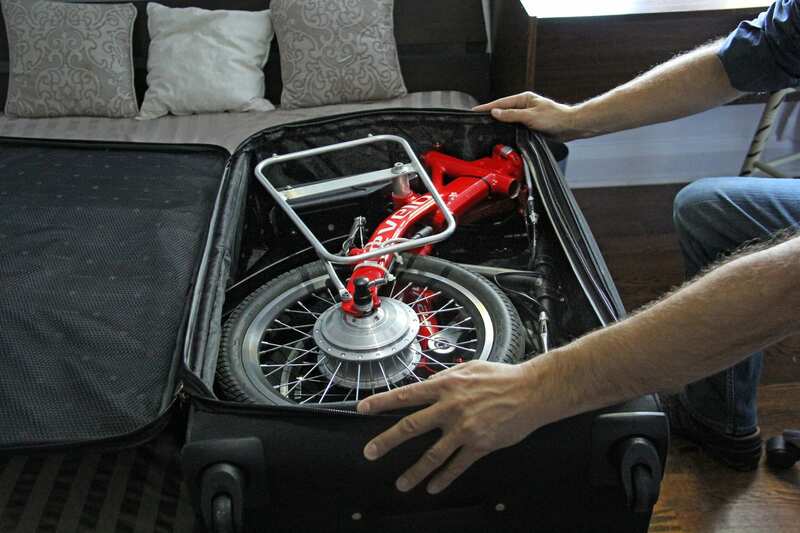 This seems like a product that might find a good sized niche in commuters, boat owners, RV owners and more. 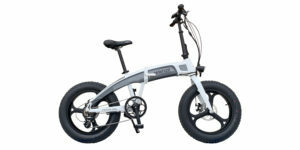 It does not really do everything an electric bicycle can, and yet it is possibly enough for someone for whom this is all they would need. 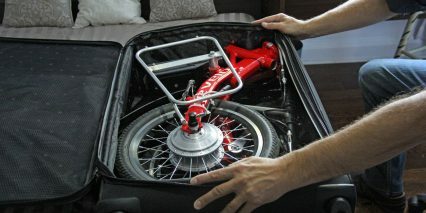 Here is another similar bike up on Kickstarter in Australia. Cool! Thanks for sharing Nirmala. Also, I’ve visited your site a couple of times and found it interesting. I appreciate your constructive feedback here and hope you’re well! Hi Court, Thanks for a very informative and insightful review. 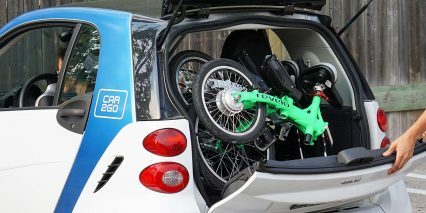 The Revelo FLEX was created to make electric transportation as convenient and simple as possible. 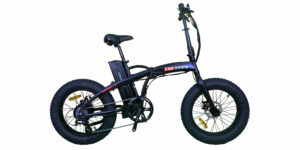 Pedaling is only intending for aiding in hills and the pedaling motion is actually quite smooth when used against the resistance of a steep hill. I have successfully pedaled up an 18% grade hill combined with the motor. Thanks Court, and glad to hear you enjoyed exploring my website. I have thoroughly enjoyed exploring on this site, so it is nice to hear that you are finding something of interest in return. 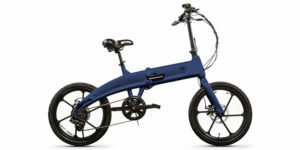 I would also have to agree with your concluding paragraph where you seem to suggest that this Revelo is definitely a niche product, especially at the price, when you can get a more versatile folding ebike for less. Greetings, Love all of your reviews! A comment on the mirror on this bike. It looks like it is a Mirrycle brand mirror, and I have these on all of my bikes. In this video review, you left it in the folding position. 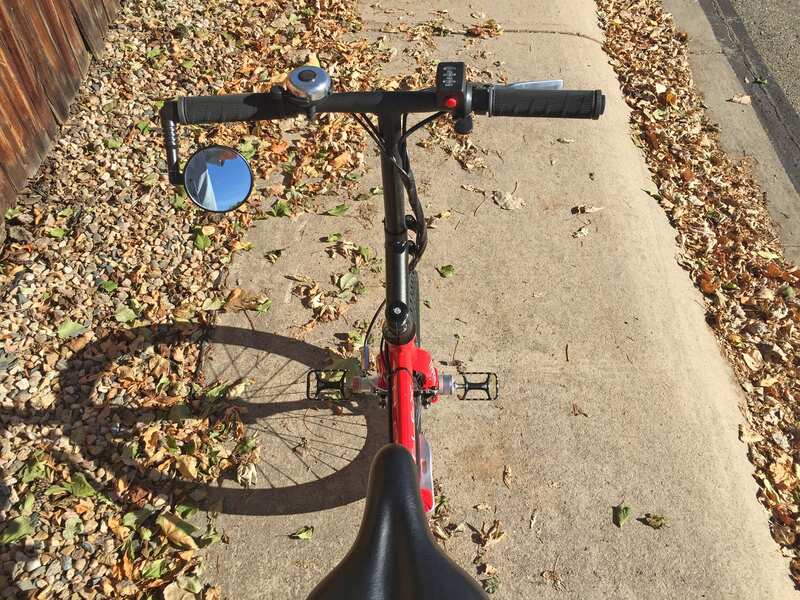 When you are actually riding, the mirror and the mounting bar should be rotated so that it sticks out away from the handlebars and permits you to actually see traffic behind you, rather than just looking at your own leg. Just a comment for future reviews of bikes that include this brand of mirror.